Background : DEATHS On Active Service. 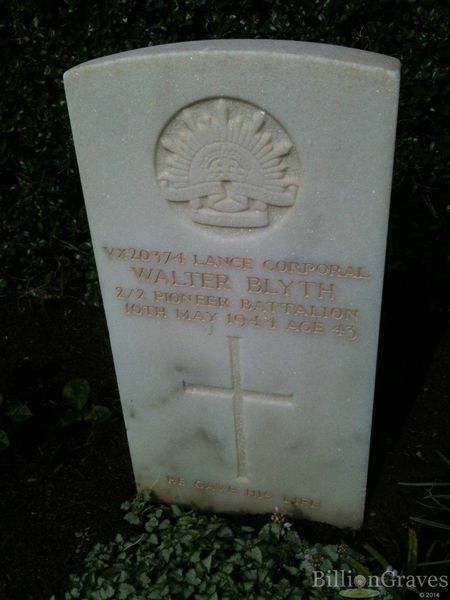 BLYTH.-- On May 16, at 115 Australian General Hospital, Heidelberg, Melbourne, Victoria, L./Cpl. W. Blyth, VX20,374, 2/2nd Pioneers (transferred Ordnance), beloved husband of Ella Blyth, loved son of Mary Blyth and late William Blyth” (Age, 17 May 1944, p. 6).